Sailing into Casablanca is an unforgettable experience, with glimpses of the Hassan II Mosque and the Casablanca Corniche. Centuries of history await to be unraveled in the seaside city known for its Art Deco Architecture and Moroccan flavor in this legendary city that is coupled with Moroccan history, Jewish History and the economic capitol of Morocco. There are Gothic churches, a Jewish Museum, Synagogues, parks, the Cathedrale du Sacré Coeur, Moroccan grand bazars and markets to explore in Casablanca,. The awe-inspiring Hassan II Mosque in Morocco, set along the majestic Atlantic Ocean is one of the largest mosques in the world within its waterfront setting and has a fascinating interior and exterior of architecture to match. Why book with Travel Exploration Morocco? Unforgettable Casablanca Tour experience: Our shore excursions are private tours of Casablanca and tailor made by a Morocco Travel Expert. Professional Licensed Tourism Drivers and Expert Historical Guides for your Casablanca Tour. Unbeatable Private Tour Prices: Don’t pay cruise line prices, when you can take a private tour. Worry-free guarantee: We guarantee a timely return to your cruise ship. Each month the Port of Casablanca is filled with various cruise ships that dock offering cruise critics and cruise ship travelers the opportunity to take in the sites and sounds of Casablanca. Casablanca is known for the Hassan II Mosque, 1920’s classic Art Deco Architecture, the Museum of Moroccan Judaism and the famous hot spot Rick’s Cafe. 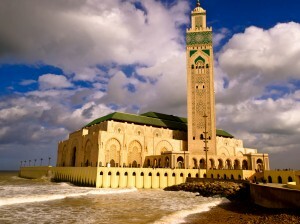 The city of Casablanca is the perfect place to take a Casablanca Excursion with Morocco Travel Experts. Two cruise ships that frequent the Casablanca Port often are the Oceania Marina and the Oceania Riviera. These Mediterranean cruises stop in Monte Carlo, Naples, Casablanca along with other a select group of other Ports in the region. Most of the Mediterranean cruises offer Casablanca excursions for large groups. As a cruise ship traveler if you prefer not to participate in a large group then considering a private Casablanca Excursion with Morocco Experts is a good choice. A Casablanca Excursion with Morocco Experts that takes you on a private tour through Casablanca’s historic sites, monuments, the Corniche, shops and markets is the ideal way to see Casablanca in a day. 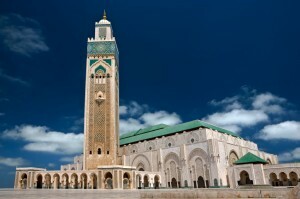 A private Casablanca Excursion offers both value and ease of travel. The Casablanca Port is located in the center of Morocco and is one of the most enticing sights available for those looking for a one-day Casablanca excursion. 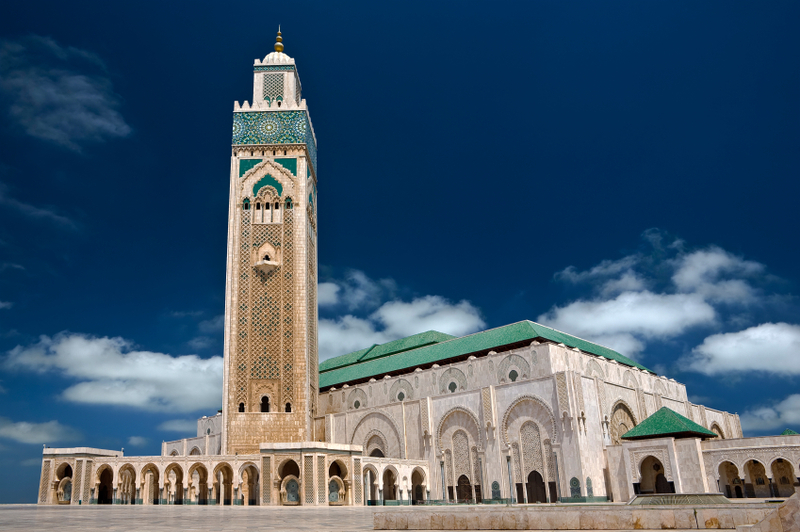 Various places to visit on a Casablanca Excursion with Morocco Experts are the Hassan II Mosque which is the largest in the world, the Corniche, the Notre Dame De Lordes Cathedral and then opt for the Museum of Moroccan Judaism or Temple Beth-El. On a Casablanca excursion with Morocco Experts be sure to take time out to shops in the city stalls of the old medina and the Habous Market. Fine Arabic carpets and the best copper and brass goods can be found on a Casablanca excursion. The Exposition Nationale d’Artisanat offers superb carpets, quality leather goods and craft ware that are worth purchasing. Moroccan painted pottery, belts made of leather, embroidered clothing and handmade jewelry are other things which you can find there on a Casablanca excursion. For lunch during a Casablanca Excursion don’t miss out on the famous Rick’s Cafe or if you are on a budget check out La Cigale or Snack Amine. For desert those on a Casablanca Excursion can visit Benis Patisserie is known for its delightful pastries. It is said to be one of the best. Travel Exploration specializes in Morocco Travel.We provide Tours and travel opportunities to Morocco for the independent traveler and tailor-made tours for families and groups with a distinctly unique flavor. From Morocco’s Seven Imperial Cities, to the Magical Sahara Travel Exploration offers a captivating experience that will inspire you. At Travel Exploration we guarantee that you will discover the best of Morocco! Call Travel Exploration at 1 (800) 787-8806 or + 1 (212) 618882681and let’s book a tour to Morocco for you today.